Israel Jason Rosenblatt’s newest album Wiseman’s Rag, produced in Canada, is interesting, eclectic, and improvisational. Depending on the connotation of these three descriptors, they can attract or repel, entice or annoy. “Is it ‘interesting’-good or ‘interesting’-bad?” one might ask, and it’s the same with the other two. The answer depends upon how well one likes jazz, and blues mixed in with it as an accent flavor. All thirteen of the original songs on this CD, several of which are instrumentals, contain the primary hallmarks of jazz – horns, wild variations in musical meter and tempo, and a meandering quality that lets one’s mind wander, too. As for blues hallmarks? 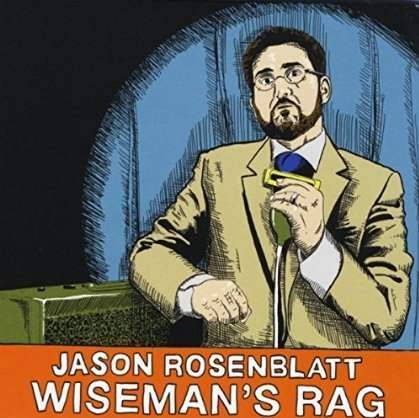 One clearly stands out: Rosenblatt’s prowess on harmonica, which typically isn’t a jazz instrument. He’s also an above-average singer, one not afraid to take risks. It’s impossible to pigeonhole his style of music. It’s definitely NOT pure blues, but on the other hand, it wouldn’t totally be in the same vein as Count Basie or Louis Armstrong. An album such as this might not appeal to U.S. pop record companies, but that’s a good thing. Rosenblatt is an artist, with a capital A, which also begins “avant-garde” and “auteur” (French for “at the vanguard” and “author”). These thirteen selections are jazz-club tunes, not dance-club tunes. With Jason Rosenblatt, as he performs on harmonica, piano, B3 organ (another typically non-jazz instrument) and vocals are Joe Grass on guitar, Joel Kerr on bass, and Evan Tighe on drums. Track 01: “Wiseman’s Rag” – With a bouncy tempo and honey-laced harmonica that will lift one’s spirits, this ragtime tune invites listeners to kick back and enjoy a cup of smooth java. Short and sweet, it“says” everything that needs to be “said” about the album. It’ll put instrumental fans in a feel-good mood. The groove of every instrument featured fits perfectly into every other one. It’s like a jazz jigsaw puzzle, with no pieces missing. Joe Grass displays melodic electric fretwork. Wiseman’s Rag may be 99% jazz, but it’s “hep” jazz!